WolfRulz wrote: Has any one tried the YHM Phantom Ti on a 5.7 SBR??? Works great on my .223 - 16" (subsonic Ammo) - Just wondering. My test results - on the YHM Phantom Ti on an AR57 SBR is a rating of 4 (firing SS197). I have basicaly the same setup as jgreenberg01 (nice video - thanks). I'm now reloading my own 40gr Vmax successfully so I'm ready to try creating some subsonics. Let the Zombies come . . . . . 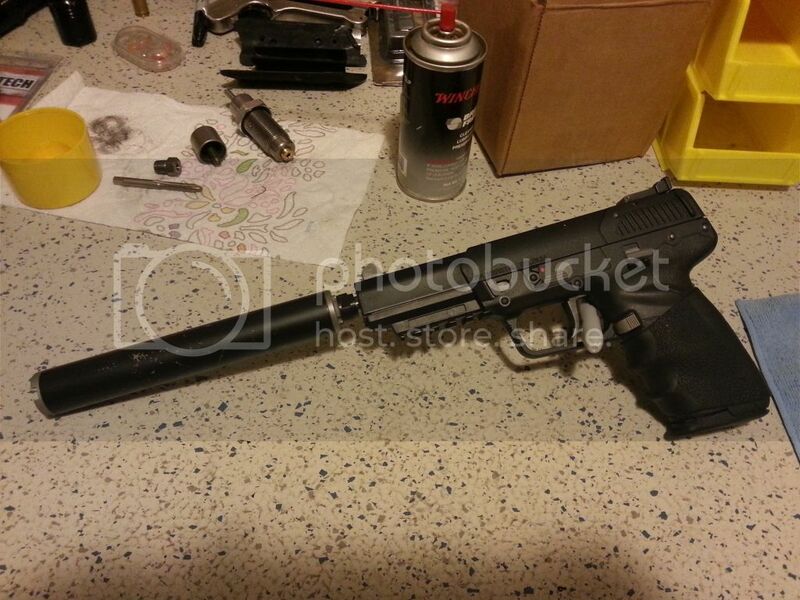 I own the Osprey 45 suppressor for my USP tactical, which is top notch, so I will be picking up one of these. I am actually in the market for a 7.62 can that doubles as my 5.56, but I expect the 7.62 at next years SHOT show. If they released the 7.62 first, no one would buy the 5.56. I like how both ends of the can are adaptable and the flash hider eliminates resonance. 3) who should do the work and avg cost? PLUS my fav, PS90, which I hope to officially (batfe paperwork)convert to shortened/threaded barrel at a later time. The stainless steel 22Sparrow is rated and warrantied for use with all rimfire rounds, .22 diam and under such as .17 hmr and .22 mag. It is also rated for use with the 5.7×28 FN round. The 22Sparrow is rated for full auto .22 lr machine guns. * tested with Walther P22, CCI Standard Velocity, 70 degrees, 5100' elevation. Thread should be standard .5×28tpi Class 3A threads with a length of .400"
Our innovative Sparrow O-ring engagement offers the additional advantage of keeping the muzzle threads of the host weapon clean and the suppressor is held secure with an o-ring placed inside the female threads to which the host weapon would thread. Silencerco offers custom adapters for the Walther P-22, The Sig Mosquito, the GSG 1911/22 to take advantage of the o-ring engagement. Note: The 22Sparrow will thread on any standard .5×28 threads and any other silencer threaded in .5×28 will thread on our adapters. Minimum overall thread and o-ring engagement is .476". The 22Sparrow is the first silencer in the world to offer the patent pending Multi Part Containment (MPC) technology, which allows the 22Sparrow to be easily disassembled for cleaning and maintenance after heavy use. Last edited by garzaro on 05 Mar 2012, 19:06, edited 1 time in total. you dont need to hurry and get a barrel. the stamp wont be approved for at least 6 months. some people choose to get a new barrel, others choose to get their stock barrel threaded. along with the threading, you will need a custom adaptor to convert it from 10x1m to silencerco's 1/2x28 o ring threads. thank you, will the adapter add much length to the already extended threaded barrel? any suggestions for who you would recommend for the job? I can verify the SWR Spectre sounds great on my SBR PS90. I don't really hear much first round pop, and to me the sound is 3 - 4 with subsonics, both the QuiTor and my own homerolled 55gr SP subs. Well boys, I suppose I will have to finally post a photo of my proprietary reflex suppressor for the PS 90 I designed and built. The platform is a standard 16 inch barrel PS 90 with a quick detach (1/4 turn) titanium suppressor which slides over the entire barrel and has the look of a P90 with a screw on unit. It's very quiet with sub-sonic ammo, pop gun sound, and with supersonic ammo, shooting without hearing protection is very comfortable... love it! slimpikins wrote: Well boys, I suppose I will have to finally post a photo of my proprietary reflex suppressor for the PS 90 I designed and built. The platform is a standard 16 inch barrel PS 90 with a quick detach (1/4 turn) titanium suppressor which slides over the entire barrel and has the look of a P90 with a screw on unit. It's very quiet with sub-sonic ammo, pop gun sound, and with supersonic ammo, shooting without hearing protection is very comfortable... love it! Pics (or video), or it ain't true. If this is who I think it is they have been using some of our SS 16.5 to test. The reflex suppressor is a pop gun with FN sub-sonic ammo, however the ammo is VERY dirty causing fouling in the barrel and bolt. I suspect this might well be due to its being designed for use in a 10 inch barrel and the longer 16 inch barrel traps too much debris. It caused a bullet to jam in the barrel and get slammed by a following round. Not good. After removal of the jammed bullets, I went over to using stock super-sonic ammo, blue tip variety and not one problem. It's obviously a little louder, however no hearing protection is required and it's much quieter than a standard .22LR round. I tried some of the sub-sonic rounds offered by Elite Ammo in the two loads produced, but neither were sub sonic as clocked by the Chronograph and hence about the same noise as standard blue tip. I don't know why this is, perhaps it's due to the factory 16 inch barrel. I feel this set up is fantastic for use with standard ammo, which is much less costly and is usable without any hearing protection and yet has full velocity vs. sub-sonic. I am very pleased with this system. Plus the suppressor is on a quick detach mounting at the receiver end, so breakdown after use for cleaning is a matter of 2 seconds. Have you tried our barrel specific sub sonic ammo? I just reformulated the 10.5 to reduce residue. finally got my FsN threaded. Liberty Kodiak and my normal supersonic reloads. No need for hearing protection. Works great. I spent all my extra money on my cruise. It's OK the Gemtech is the best I have found so far. Size, weight etc. it strikes the best balance.